Duncan Baird Publishers, 9781786781840, 256pp. A fun, non-technical and wonderfully engaging guide to that most powerful and mysterious of mathematical concepts: infinity.in this book, best-selling author and mathematician Haim Shapira presents an introduction to mathematical theories which deal with the most beautiful concept ever invented by humankind: infinity. 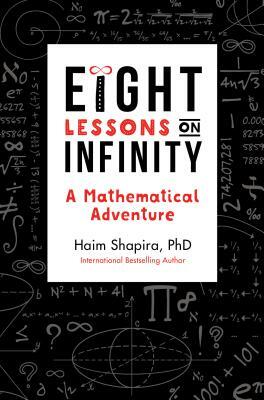 In this book, best-selling author and mathematician Haim Shapira presents an introduction to mathematical theories which deal with the most beautiful concept ever invented by humankind: infinity. Written in clear, simple language and aimed at a lay audience, this book also offers some strategies that will allow readers to try their ability at solving truly fascinating mathematical problems. Infinity is a deeply counter-intuitive concept that has inspired many great thinkers. In this book we will meet many sages, both familiar and unfamiliar: Zeno and Pythagoras, Georg Cantor and Bertrand Russell, Sofia Kovalevskaya and Emmy Noether, al-Khwarizmi and Euclid, Sophie Germain and Srinivasa Ramanujan.The world of infinity is inhabited by many paradoxes, and so is this book: Zeno paradoxes, Hilbert's "Infinity Hotel", Achilles and the gods paradox, the paradox of heaven and hell, the Ross-Littlewood paradox involving tennis balls, the Galileo paradox and many more. Aimed at the curious but non-technical reader, this book refrains from using any fearsome mathematical symbols. It uses only the most basic operations of mathematics: adding, subtracting, multiplication, division, powers and roots – that is all. But that doesn’t mean that a bit of deep thinking won’t be necessary and rewarding. Writing with humour and lightness of touch, Haim Shapira banishes the chalky pallor of the schoolroom and offers instead a truly thrilling intellectual journey. Fasten your seatbelt – we are going to Infinity, and beyond! Haim Shapira was born in Lithuania in 1962 and immigrated to Israel in 1977, where he earned a PhD in mathematical genetics for his dissertation on Games Theory and another PhD for his research about the mathematical and philosophical approaches to Infinity. He teaches mathematics, psychology, philosophy, and literature. Haim is an author of seven best-selling books. Shapira is not trying to make his readers agree with him, but simply encourages them to enjoy thinking. He is one of Israel's most popular and in-demand speakers and gives lectures on creativity and strategic thinking, existential philosophy and philosophy in children's literature, happiness and optimism, nonsense and insanity, imagination and the meaning of meaning, as well as friendship and love. He is also an accomplished pianist and an avid collector of anything beautiful.